hundreds of forum posts with others who are the same boat regardless of their income. I will confess that I am really bad with money. I’ve had some terrible financial failures and I can’t save. At all. If I have single dollar I spend it. At 32 I’ve stopped beating myself up about this quirk in my personality and started devising work around strategies. The following article is for those who have completely failed at saving to travel by all the other means. If you are like me, you will have heard all the advice already; just have self control (possible the least useful piece of advice for any life issue), use online savings account with no card access or direct debit it. Or have it deposited straight from your pay, add coins to a jar each day or put your money in a term deposit or account where you are penalised for withdrawing it – the list goes on and on and on at ways I’ve failed to save! If this is also you, here are some ideas to save for holidays that might work for you. They can hold in tours, cruises and accommodation a long way in advance (up to a year or more somethimes) without full payment. You may need to book with a large chain to have the option to BPAY. It needs to have BPAY for one reason. Regardless of where you are at the time you get paid make the first thing you do to BPAY your budgeted amount off your holiday. Do this before (not instead of) you pay any bills, put petrol in your car or shop because otherwise ‘I might just buy this, or go out to lunch or whatever’ will eat up your holiday payment. Next you can, do essential things to keep earning money like fill your car with petrol or buy your weekly train ticket. I get paid fortnightly so I also buy a petrol gift card for the second week and I make sure its a gift card that wont be accepted anywhere other than the service station (so at least my frivolous spending is limited to iced coffees and cans off coke and I can still get to work). Every time you get paid, make the first thing you do to BPAY your budgeted amount off your holiday. I can tell you as a former agent while these small payments are annoying to receipt, if they mean a large booking you wouldn’t otherwise get then its worth it. If the agent tells you full payment is required at time of booking for a holiday a long way off, go elsewhere, as not all stores have this policy. This shouldn’t be true UNLESS you are already within the cancellation fee’s of the company or wholesaler your travel product is booked for. An honest agent should generally tell you a deposit is the wholesaler or tour companies non-refundable deposit + the non refundable agent deposit (its usually around $150 and covers the agent making at least a small amount of commission for their hours or days of work even if you cancel your trip). Even some flights can be held for a long time without ticketing HOWEVER there is a risk that taxes may change (usually not much but it can be substantial), the flight could be cancelled or the airline could come to the agent on a random day and ask for full payment with very short notice (end of day!). Travel Agency Gift cards are nearly always non refundable and are specific to the agency chain. This means that once you purchase it you can’t spend your budgeted holiday money on anything else. This method may suit you better if you would rather feel like you are saving than be ‘in debt’ to the travel agent. Travel Agency Gift cards are nearly always non refundable and are specific to the agency chain. This means that once you purchase it you can’t spend your budgeted holiday money on anything else. This also means you can can start saving for a more expensive holiday a long way in advance so you have a deposit ready to go once bookings open for the holiday or tour. Mix it up if you are saving for an expensive holiday – you could save with gift cards up until the first one is due to expire then book your holiday. Generally, you don’t have to travel by the due date, just redeem them by the due date. Then you can pay off the rest of your holiday as above. If you are better at paying something off than saving up then option 1 may be better for you. If you know that it unlikely you can save spending money for your holiday a cruise may be the best option for you. Most cruises are a great all inclusive option as they include all your meals. Many cruise companies now allow you to pre-book a drinks package as well! When you go on a cruise there are optional shore excursions which can be pre-paid with credit card. First pay off your cruise and drinks package using the above method. Once this is done you can make the first thing you do each pay booking a shore excursion on the cruise companies website. No longer the domain of just families and retirees, the cruise industry is ever expanding. A cruise will allow you to see lots of different destinations without having to have money set aside for travel in between places, lunches, unforeseen expenses etc. If you can sail out and back into a home city or a domestic city near you it also means you won’t have to fail at saving the lump sum required for an international flight! You can see some of the most remote and beautiful parts of Australia even on a tour. Like a cruise, they can often include many extras like meals and day trips so you can pay your activities off before you go. As an agent the amount of times I heard someone say they didn’t want to do a tour when they had never even tried one was ridiculous. Tours often include many extras like meals and day trips so you can pay your activities off before you go. I love independent travel but I have done a couple of tours as well. I can hand on heart say that I also loved every minute of the tours I have done. Someone else has to worry about the logistics, driving after pub visits and wineries, making sure there’s milk for coffee in the morning and that your accommodation or a campsite is booked for the end of the day. Sometimes there can even be unique activities or visits organised that you can’t go to as an independent traveller. There are a large number of reputable tour companies in Australia. To search tours from multiple companies you can try Tourradar . Othewise for small group tours try Intrepid Travel, for under 35’s Contiki & Top Deck, OzExperience for hop on hop off and AAT Kings for the retired crowd. There are also lots of local tour companies especially through the Kimberley and the Outback. If you are unlikely to be able to save spending money make sure you align the start of your trip with your normal pay dates so that you will have an income to spend on holidays. If this is your only spending money make sure you book a tour or holiday that includes as many optional extras as possible like meals, day trips, local kitty etc. Alternatively book a holiday to a cheap travel destination so your money goes a long way. Do remember that some countries will require you to demonstrate you have a sufficient amount of finances before entry so avoid booking to these locations or better yet travel at home here in Australia! 6. Make sure you have travel insurance. If you don’t have any spare cash you need to have comprehensive travel insurance (you should have this regardless!). And be aware that most smaller services require you to pay upfront then you claim it back from your travel insurer. Domestic travel insurance is far cheaper than international insurance so book a holiday at home in Australia and its a much smaller expense to budget for! Most travel insurance companies now cover rental car excess BUT and its a big but, you have to have the funds to pay it first the claim it back from your insurer. This can be as much as $6000 on a four wheel drive. So while its doubling up, if you can’t save and don’t have a credit card** pay the excess, reduce it to 0 by paying the excess reduction though your agent. Not only is Australia beautiful but it is full of wild places to explore, fabulous restaurants to eat at and amazing views. It’s also safe and has other bonuses like cheaper travel insurance and no language barriers in most places! 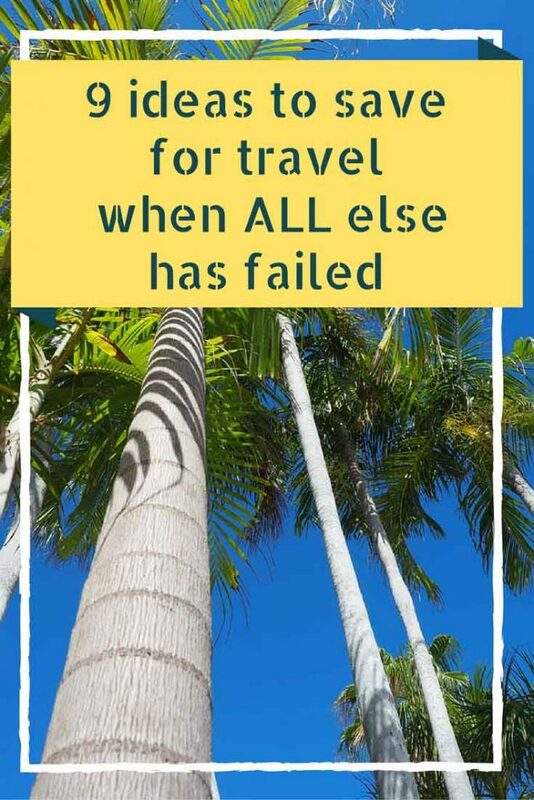 One of the biggest concerns you may have is that if your travel with little spare money, if something goes wrong while your away you may not be able to get home. While it will be much cheaper to get home last minute within Australia, flights from remote areas can still be pricey. To combat this issue, consider a flexible fare so your just paying the difference in cost if you need to change or alternatively stockpile some some travel agency gift cards to book a flight if you need to get home for an emergency. Working holidays are one of the best ways to Australia and require very little money to start (just what you need to drive or fly to your new job). They can allow you to live in some of the most beautiful places in Australia and to visit places you may not otherwise be able to afford to see. But the possibilities are endless, you may find yourself assisting with managing livestock or cleaning rooms on remote Kimberley Stations, serving cocktails on a Whitsunday island, mingling with the rich and famous as crew on a chartered boats, guiding walks through the Queensland rainforest, serving beer in an Outback pub or anywhere in between. In fact, if you are willing to relocate, even short term, you can do every job from cleaning toilets or dishes at night to free up your days, to a 9 -5 engineering job so the weekends are yours to explore your new backyard! I hope some of these ideas may help you realise that if you don’t know how to save you will one day get to travel so don’t despair. 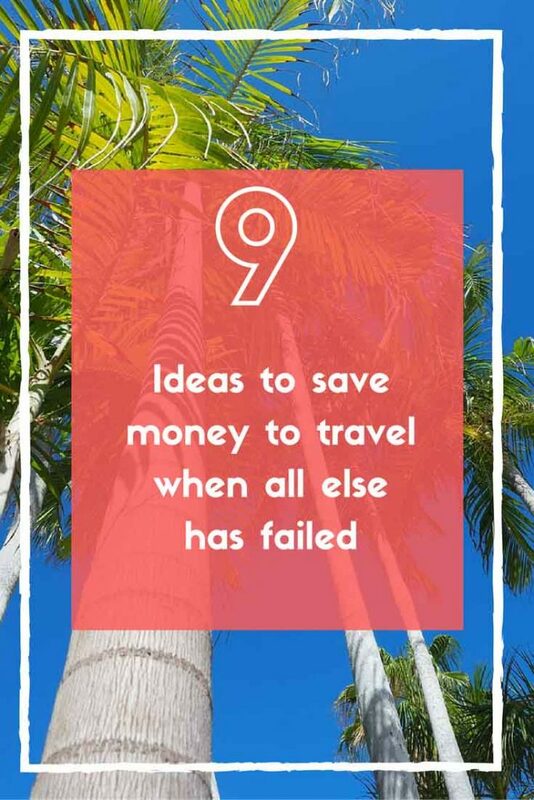 Some of these tips may help you go on holidays even if you are terrible at saving money like me! Disclaimer: This article is for entertainment purposes only, please consult a qualified professional for financial and travel advice.